The first batch to arrive, containing 120 shelter kits, was delivered aboard a New Zealand C-130 flight yesterday (Saturday, October 6), flown in from Balikpapan, the main operational hub for relief efforts. This morning, an additional 288 solar lanterns and forklift truck from the UK also arrived in Palu. Reaching the worst-affected areas remains a challenge, with damage to the runway at Palu airport meaning that widebody aircraft are unable to land. Road access also remains largely blocked. Humanitarian experts from the Department for International Development (DFID) are on the ground providing critical support to help increase the frequency of flights into Palu and the amount of aid they can bring in. A DFID team today fixed aircraft loading equipment at Palu airport, reducing the time it takes to unload the incoming aid. 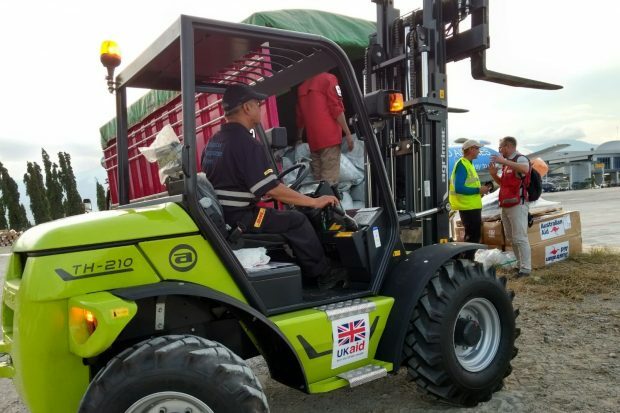 A forklift truck, part of the UK aid package that arrived at Palu airport today, will also be critical to speeding up the delivery of aid and helping supplies to reach affected communities. An RAF aircraft has been performing a critical role in transferring aid supplies for the Government of Indonesia and international donors, from Jakarta to Balikpapan. Supplies are then being transferred to Palu aboard smaller C-130 aircraft from New Zealand and other countries, demonstrating excellent international cooperation supporting the relief effort. An additional 30 tonnes of UK aid arrived in Balikpapan today and is expected to reach Palu early tomorrow, having departed Doncaster on Thursday night (4 October). This UK aid package includes air-cargo handling equipment, including an additional rough-terrain forklift truck, two heavy duty pallet trucks and two rough-terrain pallet trucks, which again will be vital to increasing capacity at Palu airport. The next batch of UK aid expected to arrive in Palu tomorrow also includes further solar lanterns and shelter kits, which, alongside the first batch of tents, which have already arrived today, will provide shelter for over 8,000 people. Current figures estimate around 60,000 to 80,000 people have been displaced by the earthquake and tsunami. The UK is working with the Government of Indonesia and our international partners to coordinate relief efforts and supplies. A DFID team of humanitarian experts is in Indonesia helping to coordinate the response and operations on the ground. The UK government is among the biggest donors to the relief effort internationally. DFID has made £3 million of UK aid available to support the immediate needs of survivors and relief efforts. It is also matching pound for pound public donations to the Disasters Emergency Committee appeal up to £2million. In addition DFID is supporting the response through our core funding to the UN and the Red Cross Movement, including to the Central Emergency Relief Fund. There has been mainstream broadcast coverage throughout the weekend on the UK's role in the relief effort. Last night, the UK Ambassador to Indonesia was interviewed on Sky News about the UK’s response to the crisis. He talked about the arrival of the second UK aid flight in Indonesia, carrying solar lanterns, shelter and ground-handling equipment. He also highlighted the need for this equipment to increase the capacity for aid supplies getting to Palu. BBC News at 10 last night included footage, filmed by the DFID Team in Indonesia, of UK aid arriving in Balikpapan. This morning, an article in The Independent referenced the UK aid's package of £3 million and deployment of humanitarian experts.